In the second game I had a great pleasure to play against Damian. 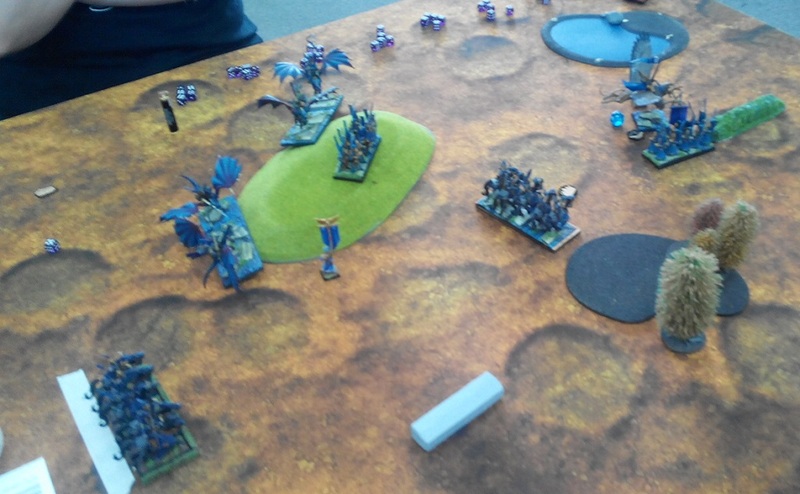 He brought his very nicely painted evil Abyssals and I was really looking forward to our game. One reason was to have kind of classic blue vs red battle (almost literally when you look at the respective color schemes!). 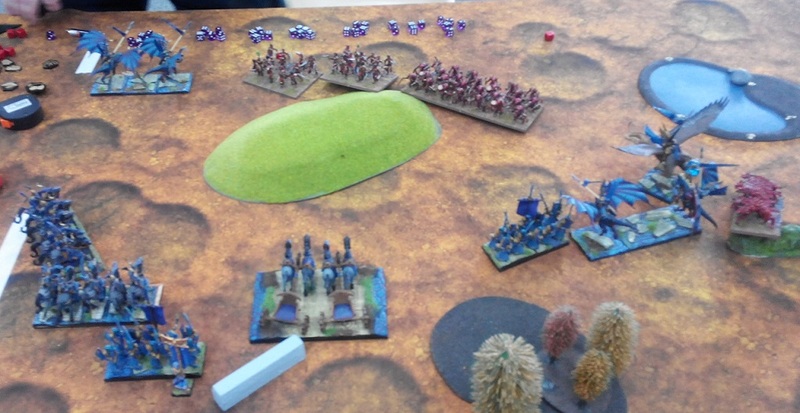 Another was that I have not played against one of the iconic armies of Mantica for some time. Last but not least I have not had a chance to play against Damian before either so it was great we were finally matched against each other. The Forces of the Abyss were definitely melee orientated and had some really good units for the job. 40 Lower Abyssals - Lower abyssals look like an average troop with Sp5, Me4+ and Def4+. However, they also sport a regeneration special ability and that makes them quite durable unit. 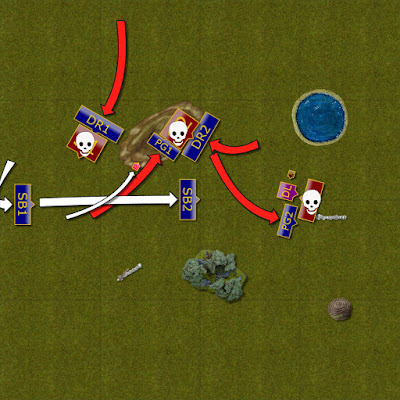 As often the case with hordes that can heal up it was very important to engineer the multiple charges so that the damage is too big to regenerate it significantly or even destroy the unit completely. 2 x 20 Succubi - Faster, lightly armored but harder to hit due to Ensnare and Stealth abilities, these units can deal a lot of damage to my units. They have mainly defense 4+ and even heavier Drakon Riders should be careful. While it is harder to hit Succubi both in melee and at range, I learned that it still pays off to shoot at them as every single point of damage counts. Then in the inevitable melee it is possible to go for the exchange of units which may be a favorable thing to do. 6 Tortured Souls - Fast hard hitting unit. They may shamble meaning they can't move at a double but with Sp10 they will be fast enough and charge range is huge. They are not as well armored as heavy cavalry so it will be a good idea to shoot at them if possible. However, the key would be to isolate them so that they either need to attack alone or can even be charged first. It still needs to be a powerful multi-charge as Tortured Souls cannot be wavered and can hit back hard. 5 Gargoyles - this is a priority for shooting targets for me simply because they can potentially interfere with my movement phase. I need to intercept them fast and destroy them in one go as they too regenerate damage and do it very well. 5 Hellhounds - very fast, nimble, with quite a lot of attacks and Thunderous Charge 1. 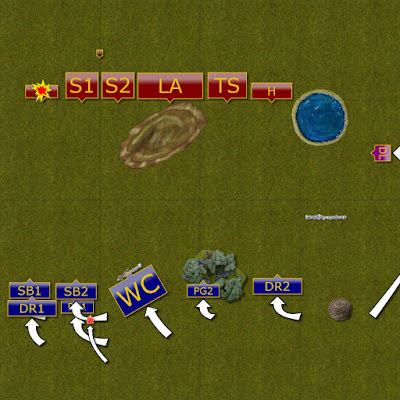 On their own they may take down my light cavalry or troops of Palace Guard but can also be dangerous if they team up with other units. Again, isolating them or shooting them down is an option to eliminate that threat. Abyssal Champion with Wings - the single hero of the army and its solitary general. Very good for disrupting large units of shooters. Can sneak around and intercept my own fliers. It will be difficult to shoot it down, as most likely I will not even be able to see it. However, my own drakon lord may potentially pin it down so it does not harass my other units. As it is often the case, I needed to come up with the idea how to divide the enemy that would otherwise prefer one on one melee. The Forces of the Abyss could potentially march towards the center and assume defensive stance. I cannot attack such formation head on but moving forward also means that the flanks can get open and unprotected. 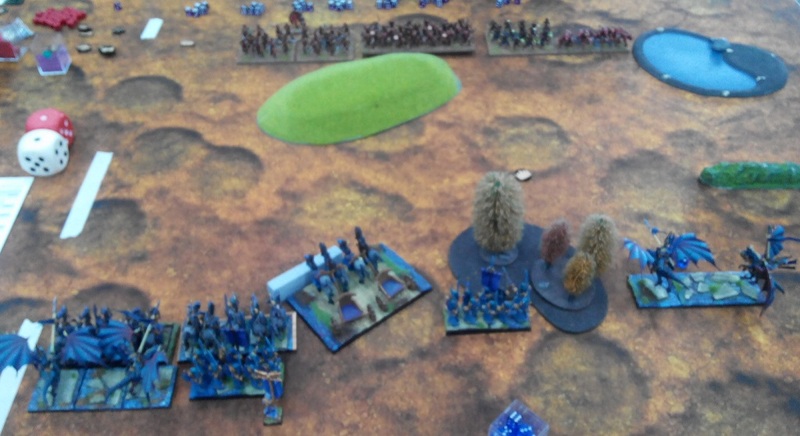 Hence, quite typically both Drakon Rider units went to flanks. One was supported by the Lord and the other had the rest of the army to fight along with. 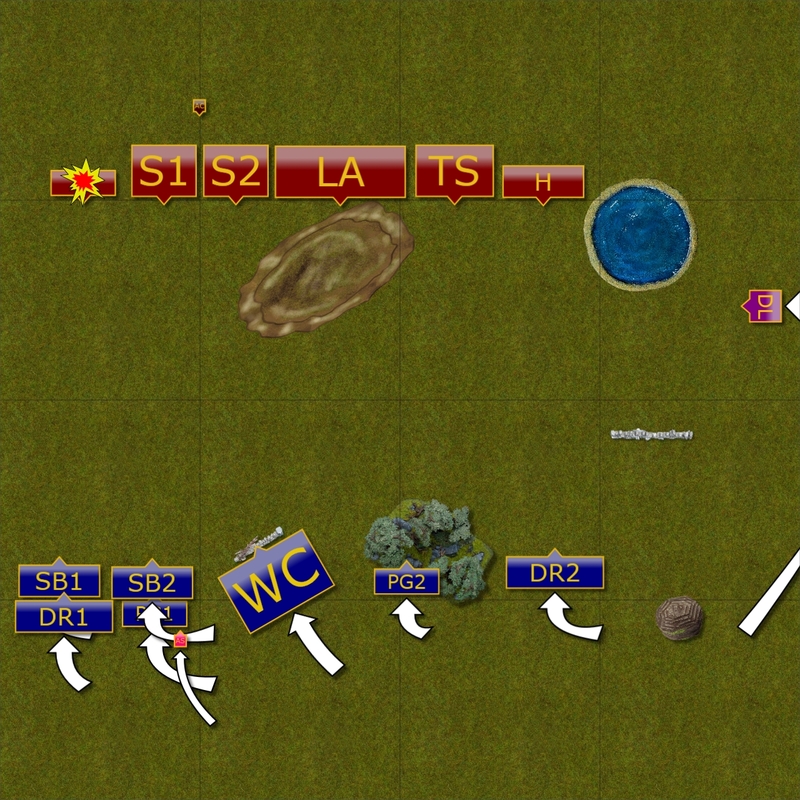 I also wanted to focus my ranged attacks so I grouped fast cavalry and the chariots there. 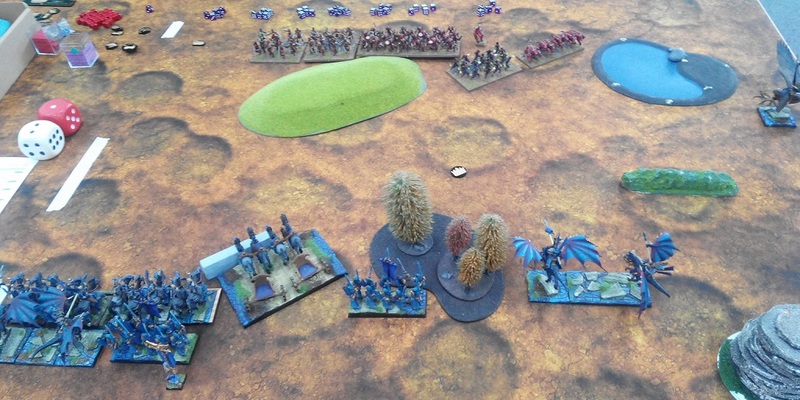 Perhaps not the best choice of the targets on the left flank but at least I could spot Gargoyles! 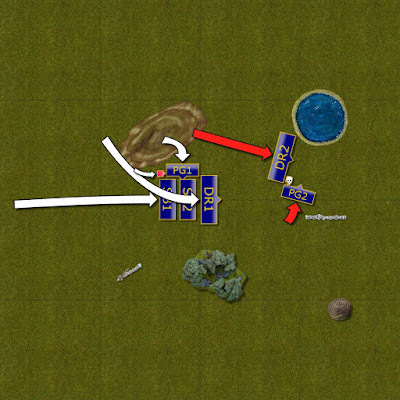 In general, the plan was to shoot on the left flank at the enemy for as long as it takes to rout the target. At the same time, maneuver the fliers to outflank the foe and constantly look for the opportunities to multicharge so that the unit attacked goes down in a single turn. If I can gain some advantage early on I may be able to go for unit exchanges too, but that is less preferable option. 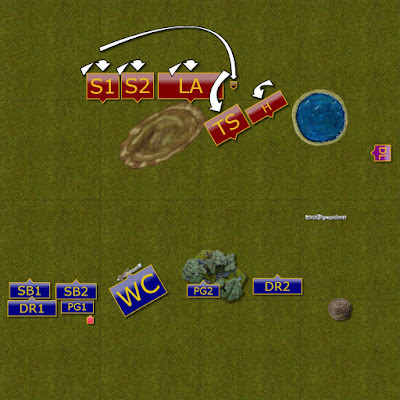 I got lucky and won the roll off and decided to take turn 1 in order to begin shooting early. 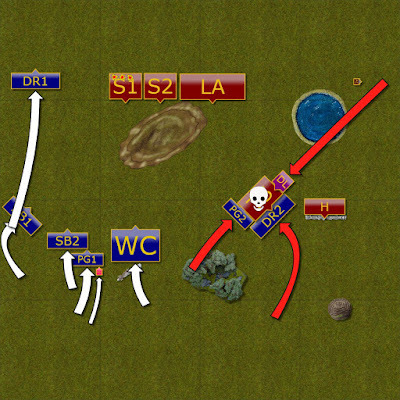 Outflanking begins on the right. 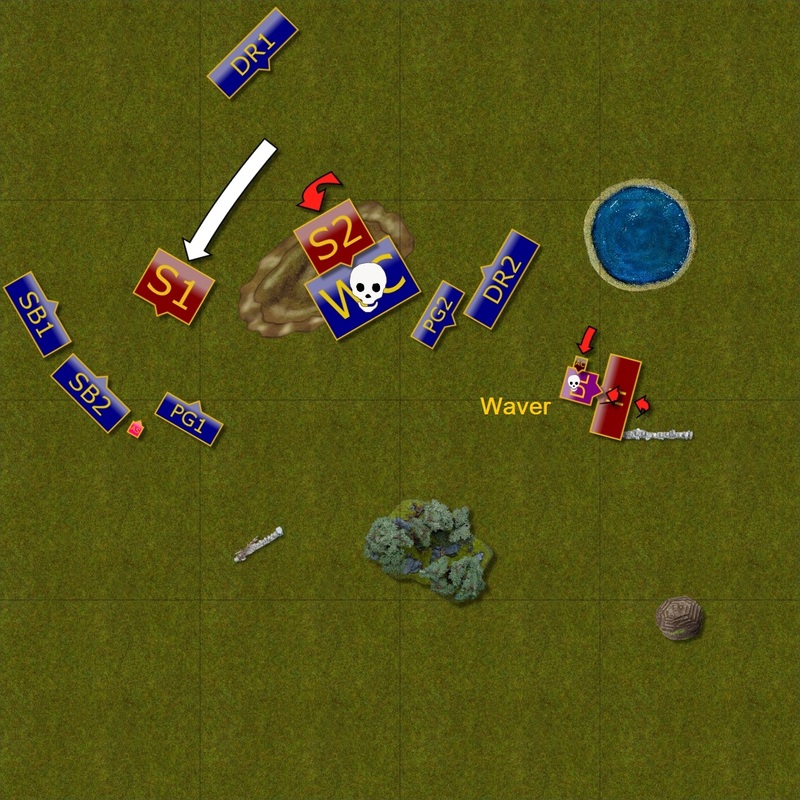 Elves took the opportunity to start shooting at their enemies early on and aimed at Gargoyles that were exposed on the flank. The arrows found their marks and first unit of the enemy was routed. In the meantime, the Drakon Lord begun its flanking maneuver while Drakon Riders moved forward a bit to keep enemy units in check. 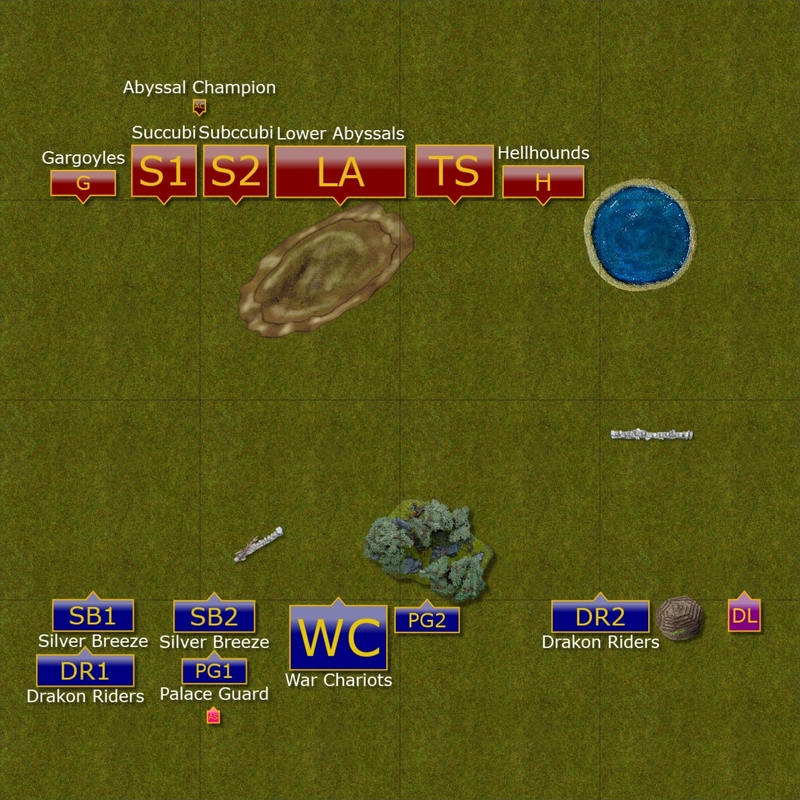 Abyssals are shy to move over the hill. The army of Evil was not so eager to leave the protective shade of the hill and majority of the units shifted to get covered from the Elven shooting. 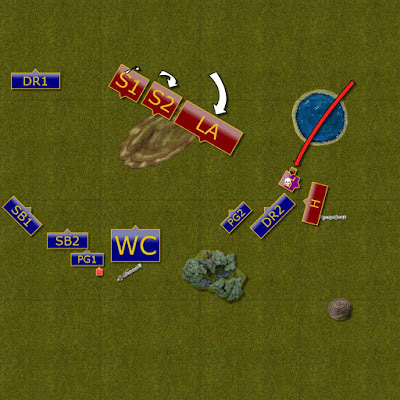 Only fast elements maneuvered in order to intercept Elven fliers on the Eastern flank. 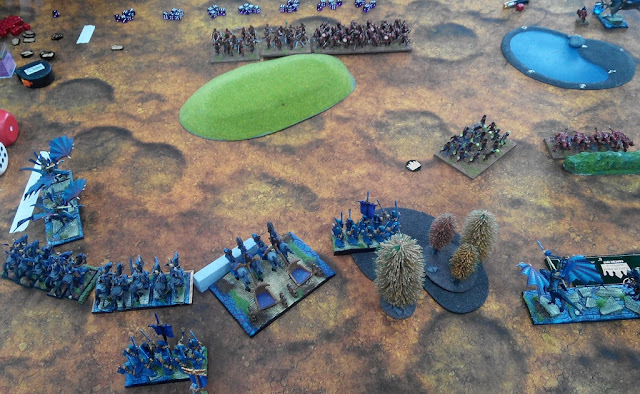 ... a bit more outflanking. Elves continued their approach and this time the shooters aimed at Succubi. 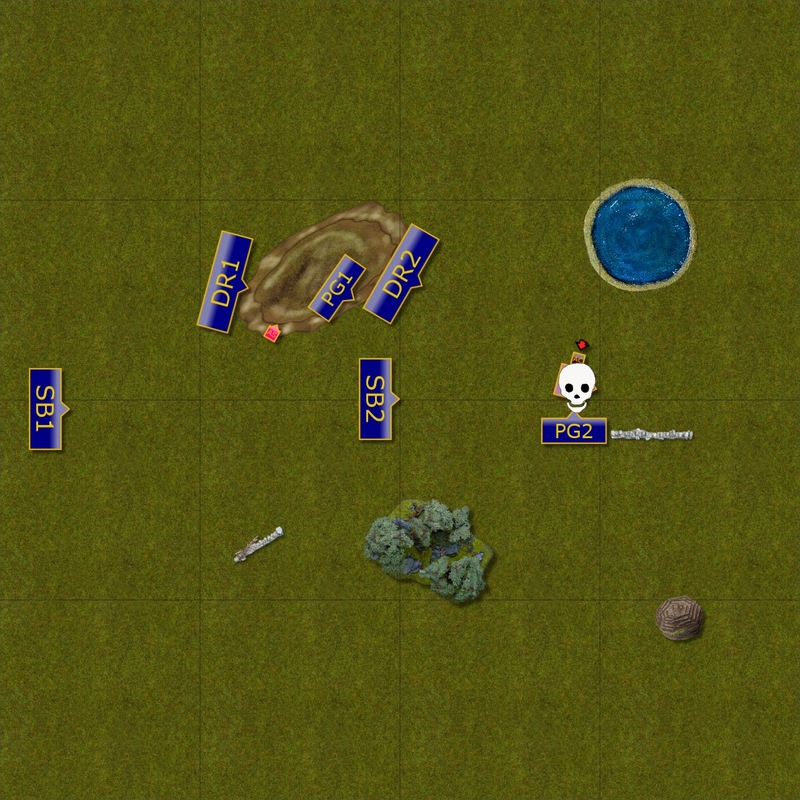 Some of the arrows still found the target but combination of cover from the hill and evil magic surrounding the unit meant the casualties were limited. Abyssals take some serious risks! 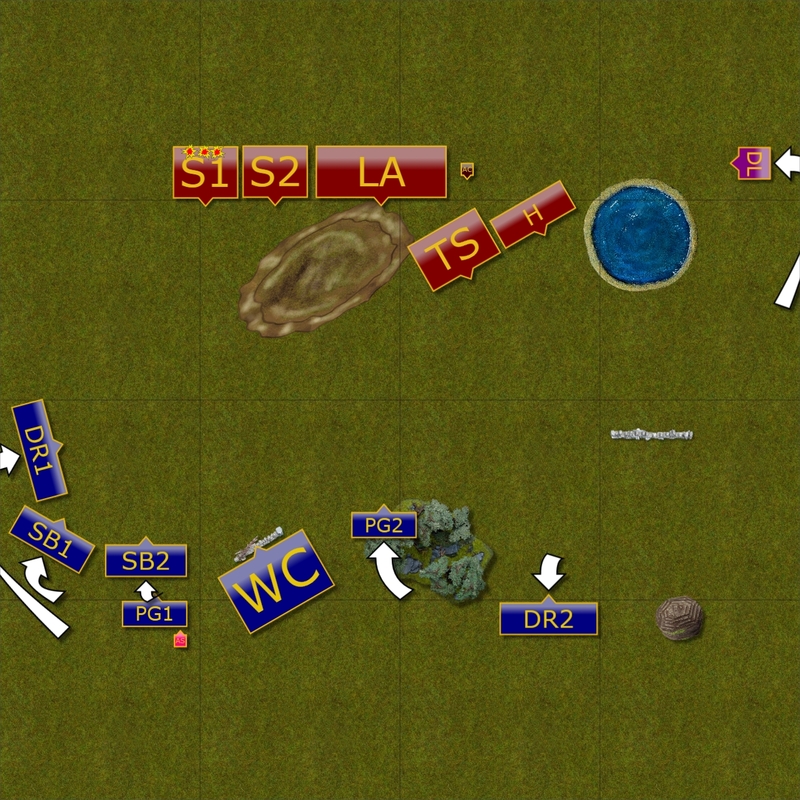 While the infantry still kept shifting behind the hill, the fast units were more aggressive in their advance. The Champion intercepted the Drakon Lord and grounded him. Hellhounds and Tortured Souls tried to corner the Drakon Riders but in doing so exposed their flanks! Elves spotted the mistake and charged Tortured Souls from three sides. Even the Drakon Lord joined the fight as although his mount could not fly it was still very fast on the ground. 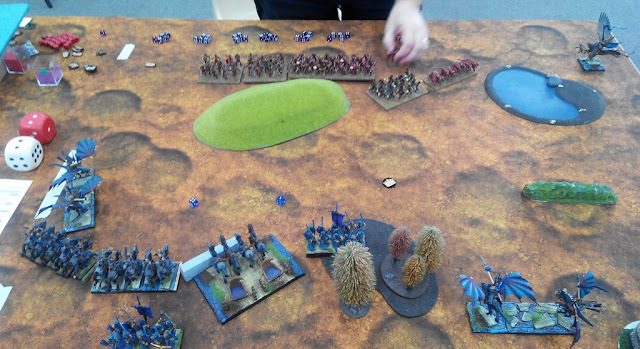 Meanwhile, on the opposite flank the shooters continued adding damage to the Succubi and second unit of Drakon Riders flew along the flank to get behind the enemy lines. The Forces of the Abyss where in a difficult position. 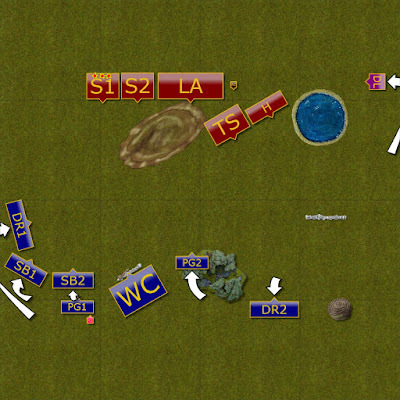 They have just lost both flying units and their flanks were wide open. 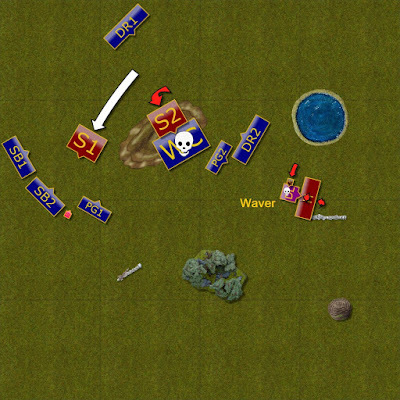 The infantry was still too far to attack any enemy unit and only furious Champion was able to attack the Drakon Lord again. 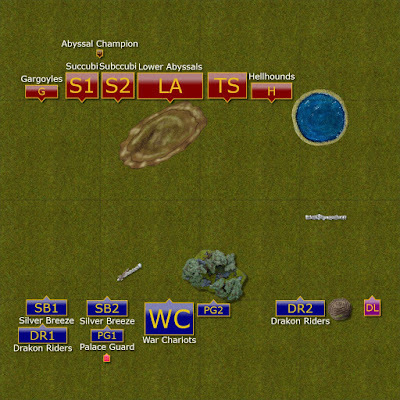 Lower Abyssals are no more! 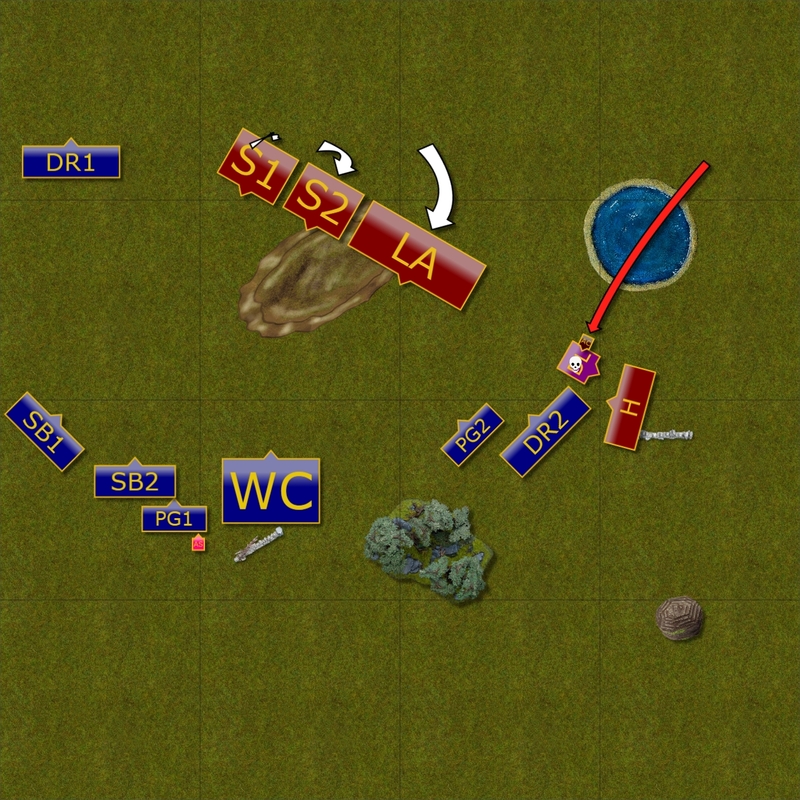 This time the Lower Abyssals were careless and Elves did not wait for them to realize their mistake. 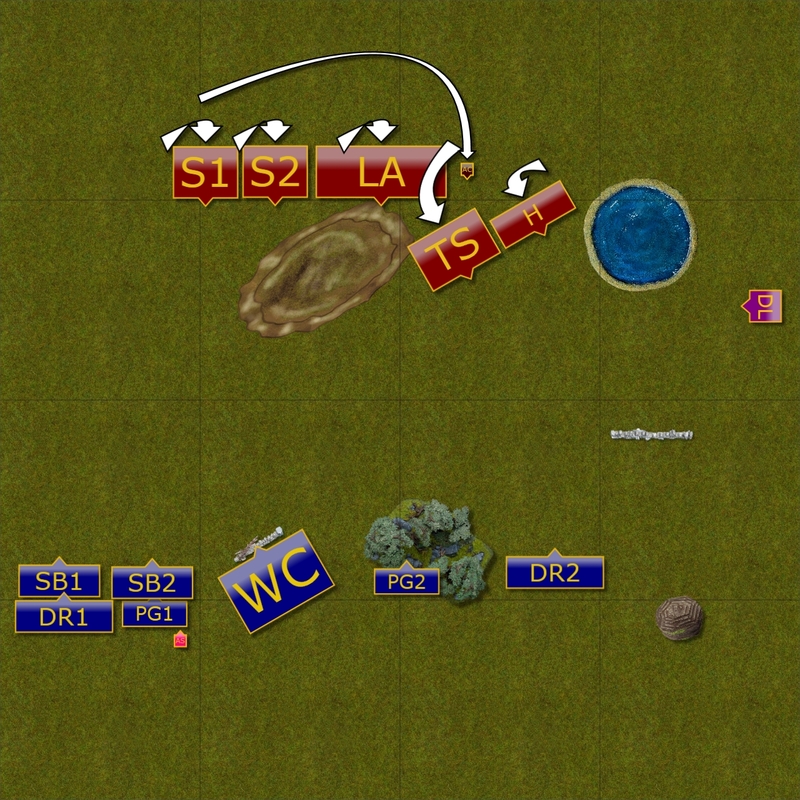 Three units charged at the same time and even the infantry horde was not tough enough to hold its ground against such a determined attack. First kill for the Abyssals! The situation looked very grim for the forces of Evil but they kept attacking. Succubi destroyed the chariots easily. 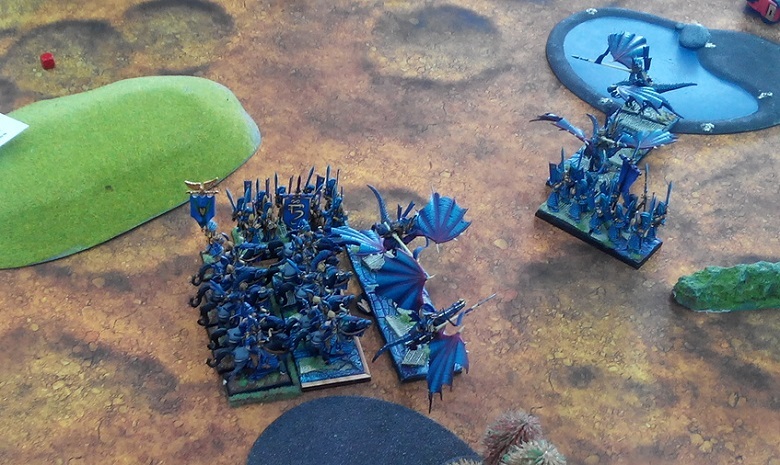 However, the Drakon Lord held the line against Hounds and Chamion - barely! Only the Champion has left! All the units were in the right places so another wave of multiple charges followed. This time all three remaining units of the Forces of the Abyss perished! Only the Champion has left and she intended to claim one final prize. Heroic Drakon Lord has finally fallen after relentless attacks of the Abyssal Champion. 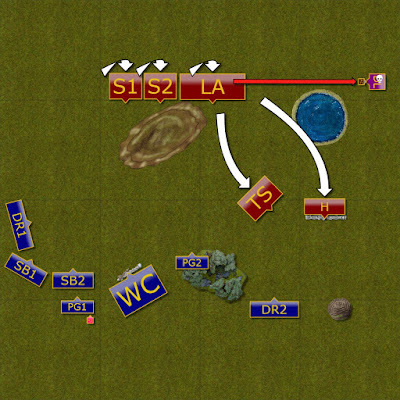 It was not going to change the result of the battle but would make the victory bitter-sweet for the Elves. The Forces of the Abyss are banished. The Drakon Lord was avenged. 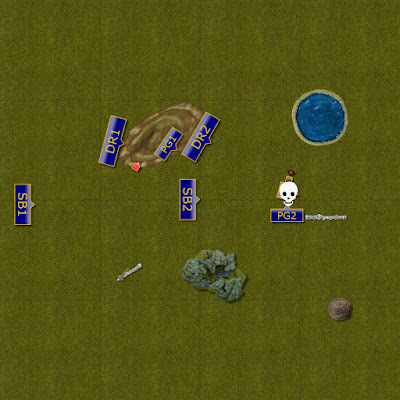 Elven forces concentrated in the middle of the battle field to dominate the area. Only Drakon Riders and Palace Guard attacked the Abyssal Champion. Entire army of the daemons was banished! While there were no forces of the Abyss anymore we rolled for turn 7 as it potentially allowed two more units to get into the central area. That mattered for the scenario and it happened that there was turn 7 so all the remaining Elven units were in the center of the battle field. I would like to thank Damian for a great game. I know it was not easy when you lose entire army but Damian took the result with stoicism. It was one of these games where the player made some mistakes only to wonder the second after why did he do that. Obviously, two moments when Damian exposed flanks of Tortured Souls and then Lower Abyssals were crucial. 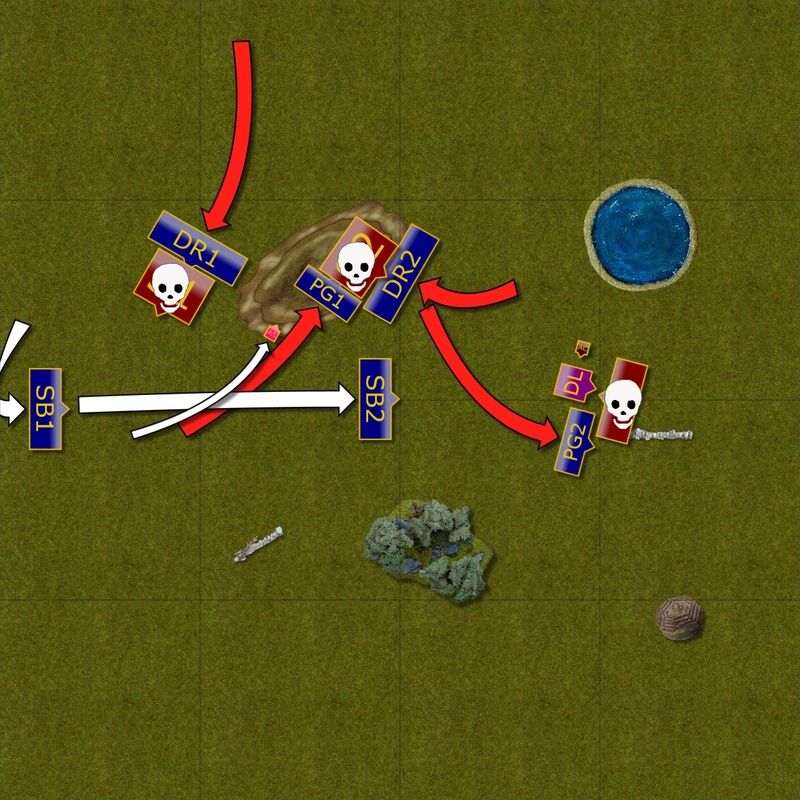 However, I also think it helped me a lot that he did not move his units in a more aggressive way. I could keep the distance and shoot at his units. Even Succubi behind the cover were taking some damage and that is why I could finish them off with a single charge. 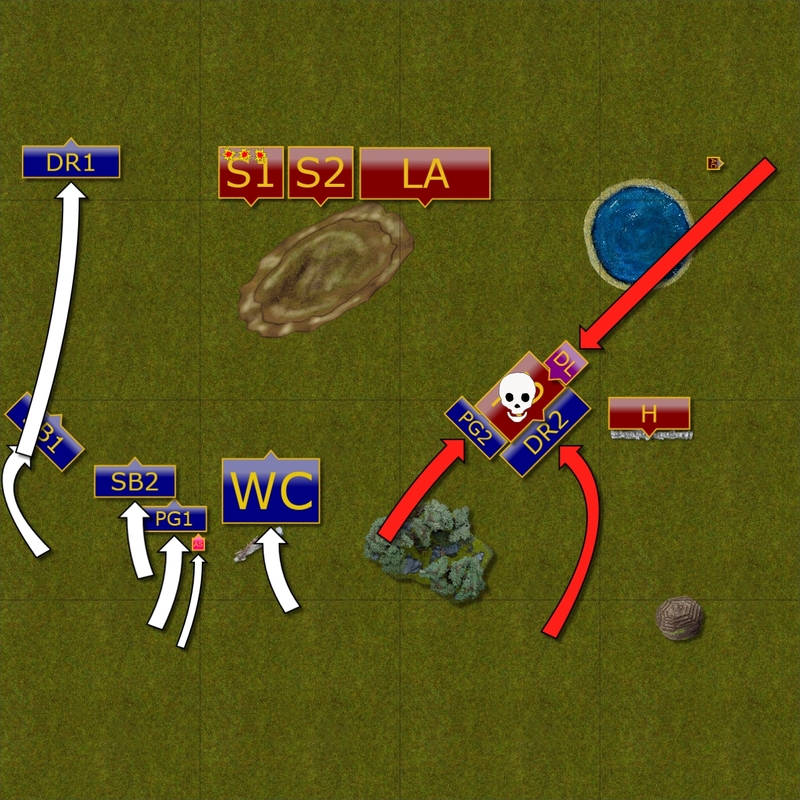 At this stage it was impossible not to give flank or rear so Damian pushed to unit forward in case it could survive and be able to claim some units. Once again, I focused on the primary objective, i.e. 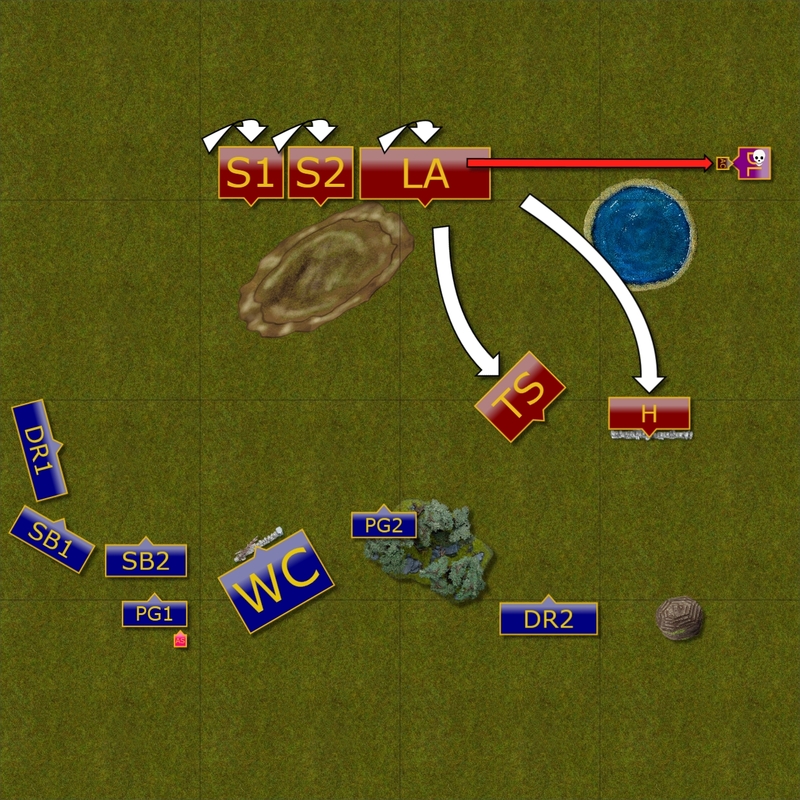 winning the scenario but did not really think how to maximize the effect. 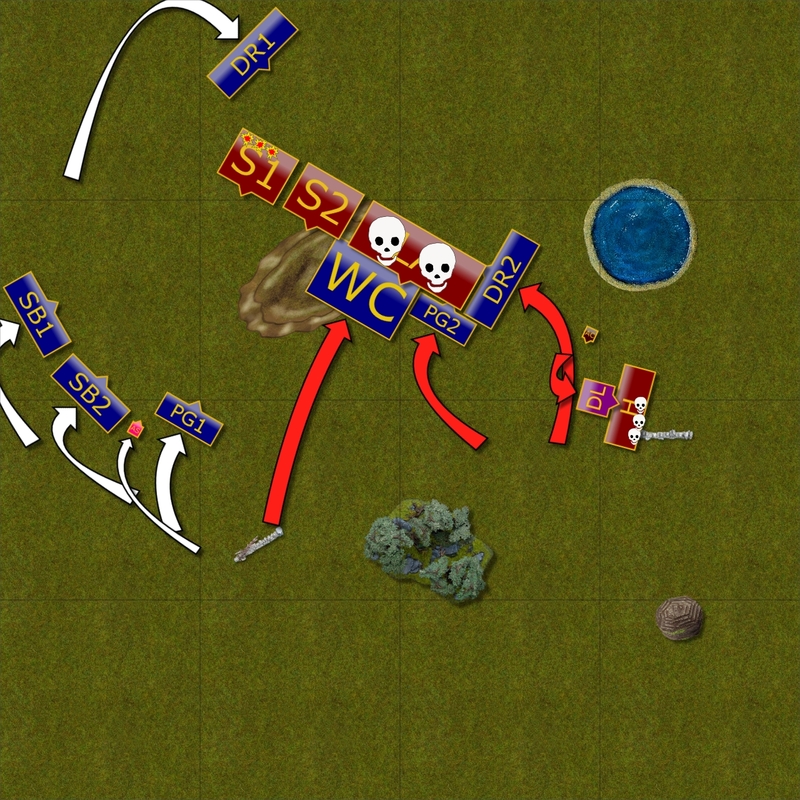 I kept attacking units because I had good opportunities to eliminate them and that was the best way to keep my own army safe. In fact, Damian reminded me that turn 7 may increase the bonus points for the scenario so I really wanted to thank him for that advise. Not much to say about this report that you didn’t mention. Very big mistakes in this one by your opponent, but we all make a few every now and again (or more than a few in my case haha). I’m sure he learned a lot from this one and will be ready for the next battle. Looking forward to reading the rest of these! Next battle in the making!